DeRouchie, Jason. 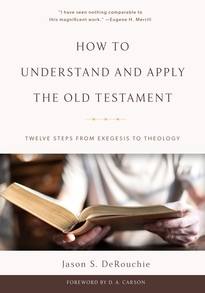 How to Understand and Apply the Old Testament: 12 Steps from Exegesis to Theology. Philipsburg, NJ: P&R Publishing, 2017. pp. 640. $39.00, hardcover. Jason DeRouchie, author of this volume, having taught at Gordon-Conwell, Gordon-Conwell Theological Seminary, and University of Northwestern-St. Paul, currently serves as professor of Old Testament & biblical theology at Bethlehem College & Seminary. In addition to How to Understand and Apply the Old Testament, he has also co-authored A Modern Grammar for Biblical Hebrew (B&H, 2009), What the Old Testament Authors Really Cared About: A Survey of Jesus’ Bible (Kregel, 2013), and other books and articles. His location in and care for both the church world and academic world is apparent throughout this work. As one might gather from the title, DeRouchie has organized his book around twelve steps that a student of the Old Testament might take in order to properly exegete the Scripture and apply its meaning. Its textbook format will feel refreshing to those who share its goals, yet it might disappoint one who had wanted more historical or critical exploration. This, however, is not to say that it is light or devotional—in fact, it is quite the opposite! Rather, to say that the volume does not deal with historical or critical issues is simply to note that DeRouchie interacts with the text-level as contained in the Old Testament rather than the composition-history of the biblical text. Each of DeRouchie’s twelve steps is organized into one of five larger groups, labeled “Parts.” Part 1 is Text—“What is the Makeup of the Passage?”, Part 2: Observation— “How is the Passage Communicated?”, Part 3: Context—“Where Does the Passage Fit?”, Part 4: Meaning—“What Does the Passage Mean?”, and Part 5: Application—“Why Does the Subject Matter?”. These Parts contain one or more of the titular 12 steps, but each is also marked with a “Track.” Using a pictogram of a mountain climber for easy identification, these tracks will orient students as to whether the section is Easy, aimed at material for all readers including beginning interpreters, Moderate, for intermediate interpreters including some modeling of the use of Hebrew, and Challenging, for advanced interpreters with some grasp of Biblical Hebrew themselves. The track system is designed to allow students to choose only material pertinent to them. Each chapter also includes a concluding section with Key Words and Concepts, Questions for Further Reflection, and Resources for Further Study. These additional components will certainly benefit those who want to use this volume as a foundation for their study and reflection, check their reading comprehension, or update their awareness of current works in exegesis and linguistics. At each of his twelve steps, DeRouchie guides the reader through an application of that particular method to Exodus 19:4-6. By using the same passage for each of his steps, a reader is able to build understanding of the methodology and see how each step benefits the others. The choice to use the same text throughout the book was one of the most helpful aspects of this work. DeRouchie’s introduction is a microcosm of the benefits and limitations of this work. He lays out four presuppositions that guide his work (3-5), ten reasons why the Old Testament is important for Christians (6-10), and four benefits of studying the original Biblical languages (12-14). This clarity is a hallmark of his writing throughout, with the list-based form one he returns to at length. Particularly notable was his forthrightness with his presuppositions, something that not many authors make so obvious. This directness allows his readers a fairer basis for following DeRouchie’s interpretive judgments made later in the volume. It also reinforces the particular aim of the book: helping students who see Scripture as God’s Word rightly understand and interpret it. In specific, DeRouchie sees the Old Testament as Christian Scripture whose full understanding and interpretation is found when viewed as part of a coherent whole alongside the New Testament. As such, this book is most valuable for those who share this particular presupposition and understanding of the nature of the biblical text. The 12-step process employed in this work allows DeRouchie to be thorough without bogging the reader down in areas not pertinent to the task at hand. In his chapter on Genre (pp. 21-97), for example, DeRouchie discusses Historical Narrative, Prophecy and Law, Psalms, and Proverbs. Each of these subsections is robust enough that they would be fruitful reference reading for a student exploring those areas, yet DeRouchie’s arrangement of them together helps the reader appreciate the diversity of the Old Testament literature and understand the care that must be taken when exegeting any particular text. This over-arching attention employed in this book’s composition is apparent when viewing the Analytical Outline (pp. xv-xix). Somewhat frustratingly, this analytical outline lacks page number references, so one must cross-reference this tool with the regular Contents (pp. vi-vii). Since a high-level detail is poured into even each small section of this work and therefore worthy of later reference, this difficulty of navigation feels like an unfortunate oversight. DeRouchie has managed to occupy an intriguing niche with this volume. It feels quite heavy for an introductory volume or for one’s first initiation to these concepts. By comparison, for example, Gordon Fee’s How to Read the Bible for all its Worth might serve as a more approachable effort along similar lines. Yet, this book is also not as in-depth as some other volumes who attempt a narrower subset of the topics under exploration. Perhaps DeRouchie’s chapter on Clause and Text Grammar is the best example of this. He begins by encouraging students to not leave their Hebrew knowledge at only the level of vocabulary and parsing but to push on towards analyzing texts, paragraphs, and pericopes (p. 186). This is of course an encouragement that his readers should follow, yet the space allowed in this chapter is only enough for a demonstration of the fruits of the method and not enough to actually teach the methodology to anyone unfamiliar with it. DeRouchie’s own A Modern Grammar for Biblical Hebrew would be better for that task, and indeed he borrows from it liberally throughout the book. The “track” system functions well here, however, and identifies the more difficult sections for students who may need to skip them. Readers who persevere with concepts they are not yet prepared for will benefit from DeRouchie’s decision to err on the side of the comprehensive and robust. This methodologically and textually robust approach continues throughout the book, yet part five contains only a single chapter: Practical Theology. This chapter is largely concerned with interpreting the Old Testament from a Christian point of view. While this approach fits well with the presuppositions outlined by DeRouchie in his introduction, his insistence that even the authors of the Old Testament itself were not privy to its full understanding (pp. 417, 421) will not be universally agreed with. Admittedly, he includes these statements to disprove the idea that the Old Testament is not valuable to Christians today rather than to argue that the revelation that the Old Testament contained was not valuable until Christ’s coming. Perhaps some more expansion of what the value of the Old Testament was prior to Christ and the penning of the New Testament would have been helpful in articulating a full understanding of DeRouchie’s approach. Likewise, some sort of guidelines for turning this practical theology into proclamation or preaching would have helped augment the book. DeRouchie continually stresses a proper cognitive approach to the text; even this section on practical theology seems more interested in categorizations and interpretive approaches than on formational strategies or application steps. This should be expected in an academic work like this one, yet in such an avowedly Christian one these extra topics may not have felt out of place. With so many choices in the field of biblical interpretation, it would be difficult to categorize How to Understand and Apply the Old Testament as a necessary purchase for scholars or practitioners. However, it remains a worthy one for several reasons. First, the ambition of the project stretches beyond that of most other books. While DeRouchie was not attempting to produce a single-stop reference for exegetes, it is perhaps the closest any recent work in that vein comes to claiming that mantle. Any student of the biblical text wishing for an orientation to a particular methodology will benefit from DeRouchie’s exploration, especially so due to his inclusion of robust bibliographies and next-steps for his readers. Second, the clarity of the writing is rare. Some of the more technical aspects and difficult concepts explored in this book are unraveled with an easy-to-understand, clear, and precise approach. Third, the organization of this book helps build a proper foundation for readers from the first chapter. This approach helps even a non-specialist engage the work, though it is likely a more helpful volume for a seminary student or someone with a level of Hebrew language facility. This is no surprise, as the volume was originally prepared as part of a course for students at the Logos Mobile Ed program (p. xxiv). For readers who have the baseline level of preparation to approach this work and the interest in going deeper in exploring the process involved in working from a text to theology, this volume is highly recommended.